Leading Manufacturer of overhead bridge crane, material lifting cranes, roof crane, lifting crane, heavy duty cranes and material handling equipment - hoist from Surat. We are providing Overhead Bridge Crane in various specifications and dimensions to our clients. With vast experience in this domain, we are engaged in manufacturing, supplying and exporting a wide range of Material Lifting Cranes. 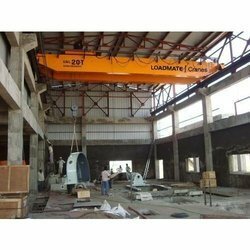 'Loadmate' Material Lifting Cranes are manufactured from high-grade raw-material procured from certified vendors of the market. We offer these in the capacity range of 10 to 35 Tons. Our Lifting cranes have extremely smooth movements that enable effective operations without any trouble. 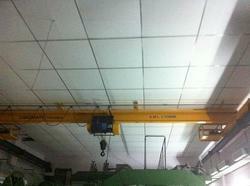 These industrial cranes are typically installed in particular area for efficient loading and unloading of materials. 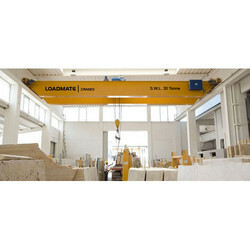 'Loadmate' cranes allow a safe & efficient lifting & shifting of heavy material load in factories, workshops and warehouses. To ensure a smooth and efficient performance while handling heavy loads, we produce the superior quality range of Roof Crane. 'Loadmate' Roof Cranes are widely used for lifting or lowering a heavy load by means of a drum or lift-wheel around. A rope or chain wraps is equipped around it. Our Roof Cranes are widely used in different areas like Steel Plants, Cement Plants and Pipe Plants. These cranes are highly acknowledged for their sturdy construction, corrosion resistance surface, smooth operation and requirement of less maintenance. 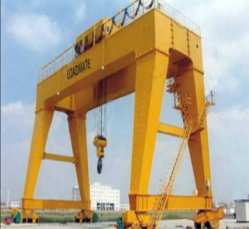 Our organization is prominent provider of Lifting Crane to our patrons. Given our vast industry experience and expertise we are providing Heavy Duty Cranes to our patrons. Since the incorporation of our organization we are providing Material Handling Equipment – Hoist to our clients. Material Handling Equipment – Hoist is designed in order to lift heavy material in bulk quantities quite easily. It is based on cutting edge technology and delivers an outstanding performance. This product is made available in latest technical specifications to cater to the market requirements. Furthermore, we are able to deliver our range in the specified frame of time after complete inspection different quality parameters. We manufacture and export a comprehensive range of Material Handling Crane to our clients. Proper study and analysis is done which as a result guarantees best design, minimum crane structural weight, wheel loads headroom and clearances which will help in construction reduction cost. Our Material Handling Cranes are fabricated using superior grade material and therefore offer high reliability and durability. Further, our engineers design these cranes after analysis of clients needs. Moreover, the offered cranes are tested on various parameters so as to ensure their reliable performance and hassle-free operations. We understand that it is very difficult to establish oneself as a bankable name in the industry; therefore, our aim is to effectively serve our clients and cater to their varied needs. For earning the trust of our clients, we focus on their complete satisfaction. Material Handling Cranes provide economical material handling in areas where an overhead crane system. We are one of the leading manufacturer and supplier of heavy duty Chain Hoist Crane. 'Loadmate' products are manufactured using premium quality raw materials by well experienced & trained professionals. 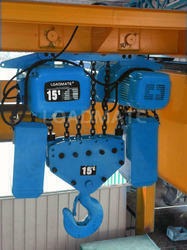 Our Chain Hoist Crane are designed as per renowned and advanced technology. There is high demand of our wide range products in industries as chemical industry, infrastructure, cement, wood manufacture, foundries, metal supply etc. 'Loadmate' products are widely appreciated for smooth and easy operating facility, longer working life and high performance. We also manufacture and modify our products to match the requirements of our worthy clients. Our Heavy Duty Cranes are highly demanded by industries that require heavy load transportation facility. We make our range available in the market in adjustable or fixed height models, which can disassembled into 3 components for better portability. Our indoor Heavy duty Gantry Crane & outdoor Heavy duty Gantry Crane are appreciated for their durability and optimum performance. Our Gantry Cranes are rigorously tested on various parameters of quality to ensure their flawlessness. We have been engaged in manufacturing a diverse range of Cranes, Hoists & Lifts, which is serving different industries for years in the markets of all across India. Loadmate’ products are being manufactured using supreme-grade required basic material, followed by a stringent quality program. As Monorail Crane are supported from the roof structure, minimised loading are usually a requirement. We also provide customization facility to our valued patrons to avail them the desired product as per their needs and requirements. LOADMATE manufactures Single Girder Bridge Cranes in different configurations. We also manufacture an underslung version. The decision regarding the configuration is made depending upon the shed dimensions and lifting requirements of the client. Our standard range of LOADMATE Electric Wire Rope Hoists is used on these cranes. 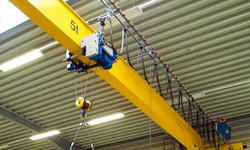 Alternatively, we can also supply these cranes with LOADMATE Electric Chain Hoists. We manufacture Bridge Crane that are widely demanded for various material handling purposes 'Loadmate' Bridge Crane are well tested on different parameters and are widely appreciated by our clients all across the world for their robust construction, high functionality and dimensional accuracy Our efficient and lightweight Cranes are generally equipped with hooks and chains that help in the proper operation. Our range of Industrial cranes is manufactured with premium quality materials and components. 'Loadmate' products are rugged in construction and robust in design. These Industrial Cranes are designed by expert technical professionals to give best results to our clients. Our products are used in various industries including foundries, steel mills, fertilizers, engineering works etc. We are highly engaged in manufacturing as well as exporting an excellent assortment of Industrial Crane for our diverse clients. The entire working of Industrial Crane depends on safe and smooth operation of the brakes so as to avoid chances of any accident. With the help of our highly skilled professionals and by using advanced manufacturing techniques, we are manufacturing, trading and supplying an exclusive range Rolling Mill Crane. 'Loadmate' rendered product range is manufactured with the optimum quality basic material accomplishing the required quality parameters specified by the industry. The offered mills are known for their optimum performance, fully automated operation, low maintenance and longer function life. Here, we can also offer these in custom finish specifications as per client’s requirements. Depending on our committed and expert workforce we are providing Industrial Jib Crane to our clients. Widely used in industrial processes to lift heavy load with ease, provided assortment is able to operate without any hassles for long time period and requires less amount of maintenance. It can easily lift tones of load with ease and is widely used in heavy duty material in manufacturing industry. We do complete inspection of our range before dispatching for sale in the market. The quality controllers ensure no flaws in the complete range by thorough inspection.